I am writing this in a cove off Ios, where we arrived in the evening. 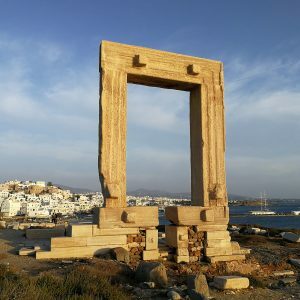 Most of our day was spent on Paros, the second-largest island of the Cyclades, namely in Parikia, the modern main town, a place of immense charm that was built upon the remains of the ancient city of Paros. We took our guests to the superb archaeological museum, its main focus being ancient sculpture from the Archaic and Classical eras. As a source of first-rate marble, and a constant rival to Naxos, Paros was also a main contributor to the development of Greek architectural and figural sculpture, and the museum contains great examples of Parian work in stone, as well as some very interesting ceramics. Afterwards, we spent quite some time in the island’s most famous building, the church of the Panagia Katapoliani (“outside the city”) or Ekatonpyliani (“of the hundred doors”), a superb example of Early Byzantine architecture. My picture, however, shows a tower of the Venetian castle, constructed around AD 1260, five decades after Marco Sanudo had taken control of Naxos and the Cyclades. Surrounded – as the image shows – by the houses of the more recent traditional and Neoclassical town, the castle is a superb example of the use of spolia, the incorporation of ancient architectural fragments into later buildings. Clearly, the Venetian builders of Parikia castle saw no need to quarry stones for their edifice – there was so much available from the ancient city. We cannot easily ascertain whether they actually demolished still-standing ancient buildings to build their walls and towers, or whether they used materials from buildings that had already fallen to the ravages of time: earthquakes, neglect, warfare, and so on. Most likely, they did a bit of both. The Venetian tower shown on my photograph is set at the northeastern limits of the Venetian fortification, and it is like a pattern-book of ancient architectural fragments, most of them made of Parian marble. 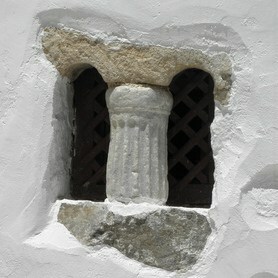 The tower incorporates column drums of at least two sizes, extensive parts of a Doric architrave from a large building, most likely a Classical temple, enormous building blocks from an Archaic structure, most likely an Archaic temple, and, as the icing on the cake, a circular building, transferred nearly whole from somewhere else, that was probably a fourth-century BC shrine to Hestia (the goddess of the hearth) and served here as the apse to a church or chapel. In many ways, this tower exemplifies the history of the Aegean islands. The people who lived in these islands did whatever they needed to do to survive and prosper, and as the history of the islands is a long one, they always found ways to use pre-existing human efforts to fulfil their needs. 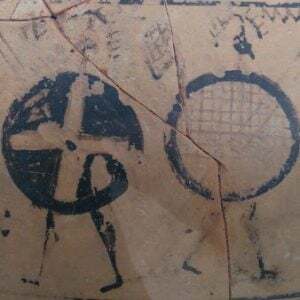 The history of the Cyclades is a palimpsest of many layers, and a close look reveals at least some of them. In the case of the castle of Parikia, the practical needs of the Venetian occupants made use of the skills of long-distant forebears whose concern had been with aesthetics. The result is a mongrel building, illustrating the Venetians’ urgent need for a defensive wall and the ancient Parians’ appetite for beauty to show off the marble their island produced and still produces. The result is a unique structure. We are now enjoying a fairly quiet night off Ios. 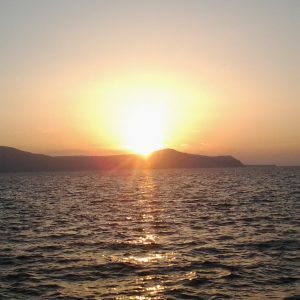 Occasional gusts of wind are whistling around the Aegean Clipper’s masts, a steady swell is rocking the entire boat and making its beams creak in a relaxed manner, and in the distance, I can see the twinkling lights of Santorini. That’s where we aim to be tomorrow, to open up one of the most amazing stories on this itinerary.